Ever wanted to know what shoulder prosthesis you were looking at on an x-ray? Are you planning a big revision arthroplasty and need to know which vendor to call for part? A good set of x-rays and the following images should help you identify most shoulder and elbow prostheses commonly used in the US. A Morse taper is used in many shoulder prostheses to allow for locking of modular heads, stems and in some cases stem extensions. This is not a univesal system. For one, the male end of the taper may be on the head component or on the stem component. The width, depth and diameter of the Morse taper also differs between companies and prosthetic designs. 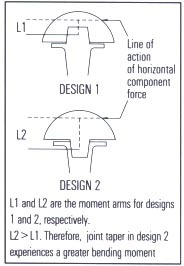 One design theory places the male taper on the stem to decrease the amount of bending on the taper which decreases the chance of head/body loosening. Another design uses the taper on the head to make revisions, particularly with the glenoid, easier since the taper isn't protruding into the glenoid when the head is removed. Without this obstruction, glenoid component resection, emplacement and non prosthetic glenoid arthroplast (Ream and Run) are possible with the need to resect the humeral component. The first shoulder prosthesis know was done by French surgeon J.E. Pean in 1893 in Paris. This prostheses was made from gum and platinium. A chronic infection necessitated removal two years later. In 1914, F. Koenig made a shoulder prosthesis out of ivory. In 1952, Krueger developed shoulder prostheses made of vitallium ( Krueger ). During this period, Charles S. Neer II. developed the modern monoblock prosthesis. Later a, polyethylene glenoid socket was created for Neer's shoulder. In Europe, several designs were developed in the 1960s and 1970s. This included Scales and Lettin 1969, Reeves and Jobbins 1971, Zippel 1972, Kölbel 1972, Kessel 1973. These earlier prostheses had a high loosening rate or about 50%. Towards the end of the 1980s, the modular shoulder prostheses was developed. Mismatched heads and glenoid were also being developed during this time frame. The fist third generation shoulder prosthesis was designed by Ph. Beaulois and G. Walch in France. It's variable neck angles and eccentric head allows for closer approximation of the prosthesis to mimic the original anatomic structure of the shoulder. Later fourth generation shoulder were developed allowing for variable head positions in 3 axes and in situ positioning of the head.